Noah and I had our weekly ‘Game Night’ while Sophie and Lisa were off at piano practice. Noah decided on a quick game of Metro so that we could get that over with and get to my nightly aural reading of The Keys to the Kingdom – Mister Monday by Garth Nix that he and I started a few nights ago. Metro is one of many simple “Gateway” games. 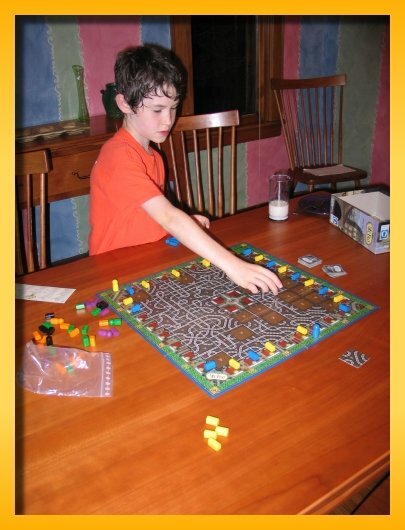 Gateways are simple Eurogames that can be used to introduce non-Eurogamers to the boardgaming hobby. They usually have the feel of many of the more complex (and more interesting) Euros but without the length or complexity of play. When new gamers play them, they get used to the water without getting too wet. This was the most boring game of Piratenbucht I have ever played. When only three play, there are two Black Beards plying the waters. The intent is to limit the number of interesting locations to make battles more likely. On the first turn, we chose our destinations and Noah and I battled. I defeated him and he had to go to Pirate Island for repairs. For the next eleven turns, we never picked the same island. We never battled again. I even tried to pick a location that I thought would be the most interesting to Sophie at one point but she went for Treasure Island. I eventually won by one Fame Point but wow was that ever a silly waste of time. I’m not fond of the game in the first place and this did nothing to make it better. 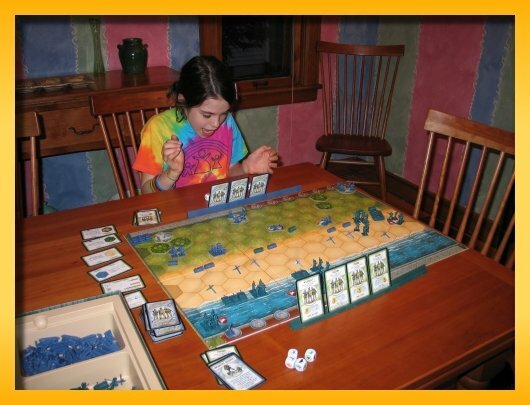 Sophie and I played the Sword Beach Scenario (June 6th, 1944) of Memoir ’44 this evening. I concentrated my Allied unit attacks on my right initially and was able to defeat the Axis bunker, the infantry unit behind the bunker and my British Commandos were able to secure Lion su Mer for a badge. However, the Axis artillary in the center was decimating my center and try as hard as I could I could not destroy it. Sophie replentished an artillary unit with a Medics & Mechanics card and was back to full strength slowing picking off my units from long range. I was in a relatively strong position along my left against her weakend Axis position but I could not hold out long enough on my right and center against that bunkered artillary unit. Sophie eventually won 5 badges to 4. 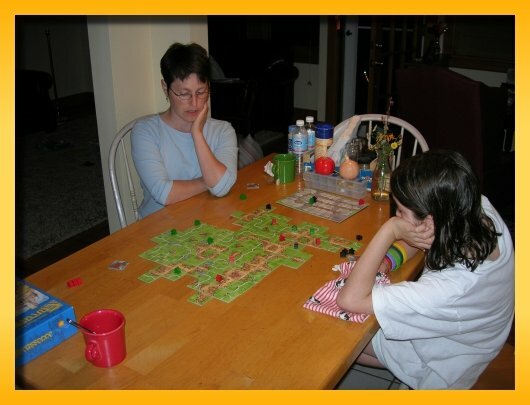 Author mattPosted on September 20, 2005 January 27, 2016 Categories All Posts, Board GamesLeave a comment on She did it again. High Five …er Hive Five … er High Hive? Noah and I played a couple games of Hive tonight. I think I’m hooked. I played a single online form of the game and decided I liked it enough to make my own version of the game. After finishing it this weekend, I’ve played four games and it’s a keeper. 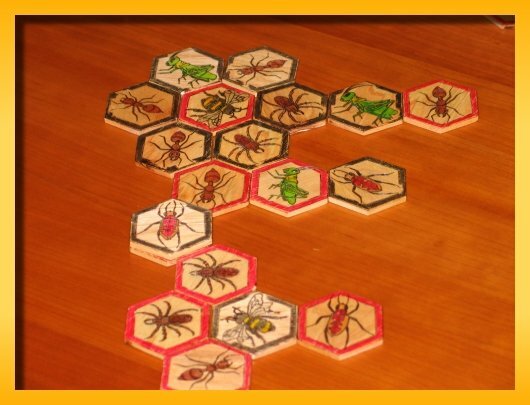 Hive starts with each opponent having 11 tiles (3 ants, 3 grasshoppers, 2 spiders, 2 beetles, and one bee). 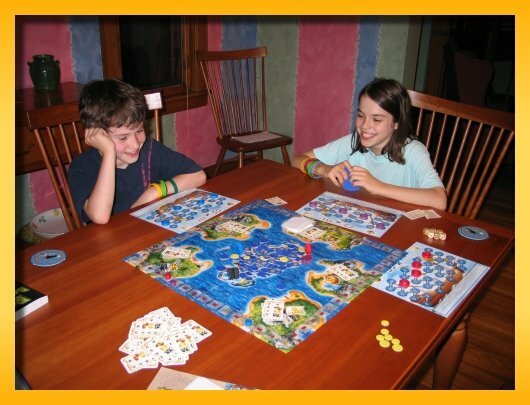 Play starts by each player placing a tile adjacent to one another on the table. The winner is the first player to cause the opponents bee to become surrounded on all sides by tiles. The bee must be placed within the first four moves. Moved tiles can touch any other tile. The spider must move 3 positions and must remain in contact with the ‘hive’ at all times. The spider cannot double back during the move. The ant can move any number of spaces but must remain in contact with the hive at all times. The beetle can only move one place but can jump up on top of other tiles (holding them in place) and changing the color of the tile potentially allowing new tile placments. The beetle can only move on top of another tile (it cannot be placed there). The bee can move one space and must remain in contact with the hive. The grasshopper moves linearly but can jump up and over tiles must stop and drop into the first empty slot it finds in its straight-line jump. The hive can never be divided into two hives before, after, or during a move. A piece can only move if it can be slid out of it’s spot in the hive (excepting the beetle and grasshopper). The game has a very chess-like feel but it can last only 10 or 15 minutes. I have heard of games going for over an hour but I would think that would be rare. It’s surprising what only 11 pieces can do. Author mattPosted on September 19, 2005 January 27, 2016 Categories All Posts, Board GamesLeave a comment on High Five …er Hive Five … er High Hive? Noah and I finished up our M44 – Toulon Scenario tonight and he crushed me. After that Sophie wanted to play Alhambra so Lisa, Sophie and I got in two scoring rounds before it got too late (school night). There were only about 7 or 8 buildings left in the bag so it was very close to a complete game. Noah didn’t want to play. He was too busy researching Bigfoot and the Loch Ness Monster for a report he was doing for the Gifted and Talented program at school. Author mattPosted on September 15, 2005 January 27, 2016 Categories All Posts, Board GamesLeave a comment on Walls Rule! 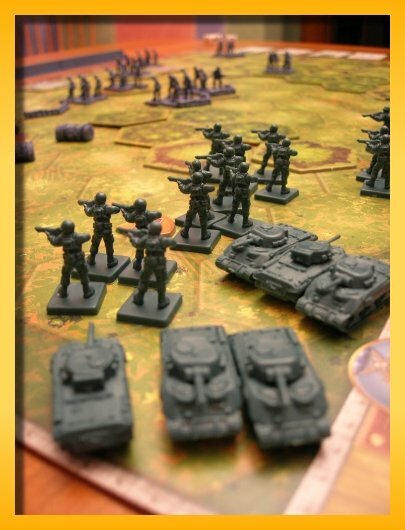 Memoir ’44 – Toulon –or– I’m getting crushed! Lisa took Sophie to piano lessons so Noah and I broke out Memoir ’44 and played the Toulon – Campaign for Southern France scenario (first assult wave August 20-26 1944). 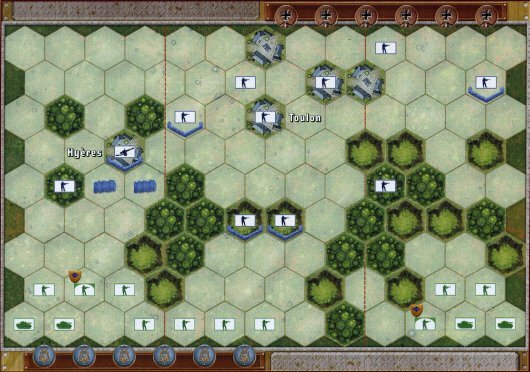 I played the Axis side and Noah took firm control of the Allied troops including 1 ranger and 1 commando unit of special forces and, count them, 4 tank units. Within the first few moves Noah was able to remove my artillery unit with a lucky shot from some advancing tanks. This destroyed any hope I had of securing my right flank. On Noah’s right he advanced infantry and both tank units up over the hills and into the trees. We battles for ground on his right flank but I was eventually destroyed by the advancing tanks. It got too late to finish and we let it sit until tomorrow but the game currently stands at 5 medals to 3 and I’m starting to shrink into my center. I still hold the high ground just south of Toulon and the city itself and I have a two wounded units in the city of Hyeres but they’re isolated. I have a “Dig In” command card so hopefully I’ll be able to sand bag my positions in the cities and keep the high ground to the south. 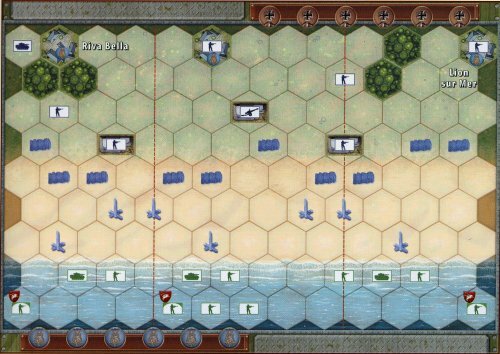 Author mattPosted on September 14, 2005 January 27, 2016 Categories All Posts, Board GamesLeave a comment on Memoir ’44 – Toulon –or– I’m getting crushed! I set up a Pitch Car before anyone got to my house. I had never taken it out of the box for AGN. Ken and Rich gave the cars a few token flips but I don’t think they were fooled into thinking it was a real game so I quickly packed it up and we got down to business. First up on the docket was a round of Coloretto. I have played it with my family before but this was the first time for AGN. I think it went over pretty well. I suspect it will hit the table again in the weeks to come. Tim showed up at 8:30 so we closed up Coloretto and next up was Pick Picknic. Rich was the only one who had played before so after laying down the rules we were quickly taking corn and feeding the chickens to the foxes. Pick Picknic is a light cube and card collection game that employs the “everybody play at once” mechanism like 6-Nimmt and Piratenbucht (among many others). Our ‘time consuming’ game for the evening was Ticket to Ride Europe. Rich, Ken, and I had played online before but we ran through the rules for Mat and Tim and set off. Tim (red) kept all 4 route cards from the beginning. We laughed. We scoffed. We laughed again. But on the final turn of the game he made his last route. Ken (yellow) on the other hand went for the Hail Mary and managed to just finish out five…yes…count them…five route cards. Mat (blue) made a goofy turn mid-game (later called a ‘mistake’) that totally messed up Rich. Rich (green) and I (black) were fighting for the longest train bonus. I had kept two route cards from the beginning but ended up drawing another set of routes mid-game that allowed me to easily keep two of the three routes. Rich never drew more routes and ended up having to use a station. In the end, Rich and I tied for the longest train (37) but his lack of additional route cards cost him the extra points. Final scores were Mat (85), Tim (94), Ken (98), Rich (100), and me (109). It was a great game night especially given that we were able to play 3 different games. Although Coloretto and Pick Picknic weren’t full games I was glad we played. Several pictures for AGN – September 2005 are available in the gallery. (Edited 09/13/2005) – Rules clarification. When two people tie for the longest train, both receive the full 10 point bonus. Rich and I split the 10 point bonus so the scores have been adjusted appropriately bring Rich into 2nd place forced Ken down to 3rd. Lisa was at a parent orientation for the preschool she teaches at so the kids and I played Noah’s choice this time: Metro a light tile-laying game. In Metro, each player is attempting to create a long subway/metro track in front of their colored cars to connect each car to a station. The more tiles your track covers the more points you get. 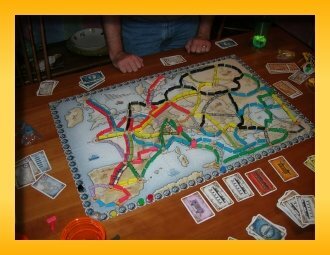 If you connect to a station in the middle of the board, you double your points. 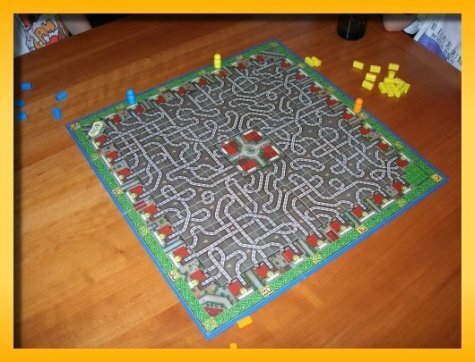 Each track tile contains a spaghetti mess of eight tracks that when laid connect all eight tracks that can possibly reach that tile (no tile is unplayable). Track tiles curve the track [tight] left, [tight] right, straight, or sometimes doubles back on the adjacent tile. At game end, all tiles are laid, all cars have been connected to some station, and points get awarded to each player for all of their cars. 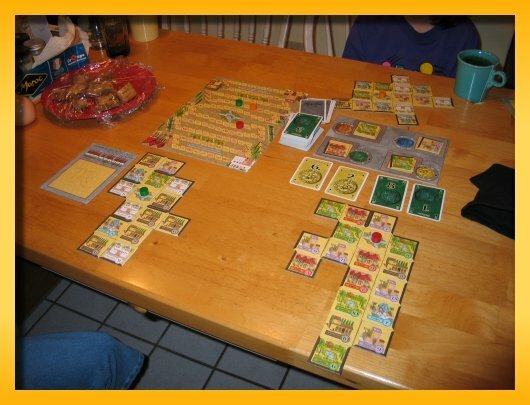 Dirk Henn designed the game in addition to Alhambra; another game we really enjoy. Noah was spending the night at a friends and Sophie wanted to play Carcassonne. She originally got out Carcassonne The City but then got hooked on the thought of placing “monasteries” which “the city” lacks. So we got out the ol’ original Carc with the Inns and Cathedrals Extension. Sophie and I secured a Cathedral City for a huge score leaving Lisa in the dust. Sophie and vied for the lead but my strong position against Lisa in the farmer fields proved to be the winning edge. While Sophie and Lisa were away at piano lessons, Noah and I had a go at Torres. It had been months since it had seen the table and it was Noah’s first time. As usual, kids pick up the rules extremely quickly and he was off and running without any problems whatsoever. 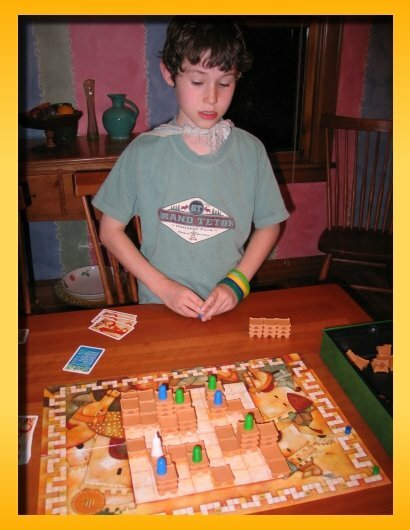 Torres is a great little game that was recently reprinted and now readily available. My copy is an original version but as I understand it, the reprint has only some minor rule differences. In Torres, your job is to build up castles by placing blocks near and on top of the original 8 starting blocks. You can neither join adjacent castles nor create additional castles. You are awarded points by placing your knights (the colored pawns) within the levels of the castles. The higher the level, the more points you receive. There is also a king’s bonus awarded to knights at specified levels of the king’s castle (the large white pawn). The specific target level changes from one phase of the game to the next. The game progresses on an Action Point Allowance system. When it’s your turn, you can ‘spend’ 5 action points to place a knight (2 points), move a knight (1 point per square), build a castle block (1 point), take an action card (1 point), play an action card(s) (0 points), or move your scoring pawn on the track 1 square per point. The Action Cards allow you to perform ‘super moves’ on you turn that would not normally be allowed (e.g. spend 7 points this time instead of the normal 5). The game is arguably classified as an abstract since the theme (the castles and knights) is pretty thin in the same manner that chess is a battle between warring medieval factions. I do not, however, enjoy chess. Torres, on the other hand, is an enjoyable quick game for two that retains great play value up to 3 and 4 players.